Diamond Links was the 2007 Mystery Quilt on the Yahoo! Group apocketfullofmysteries owned by Dorothy Young. It’s been a top so long and I’ve gone through a couple of computers I’m not sure I even have the pattern any more. Unlike more recent mysteries where I pull from my stash, most, if not all of the fabric was purchased specifically for this quilt. A couple of people have commented on the border fabric. It is Pattern # BTR-4407 from Blank Quilting with a copyright of 2006. 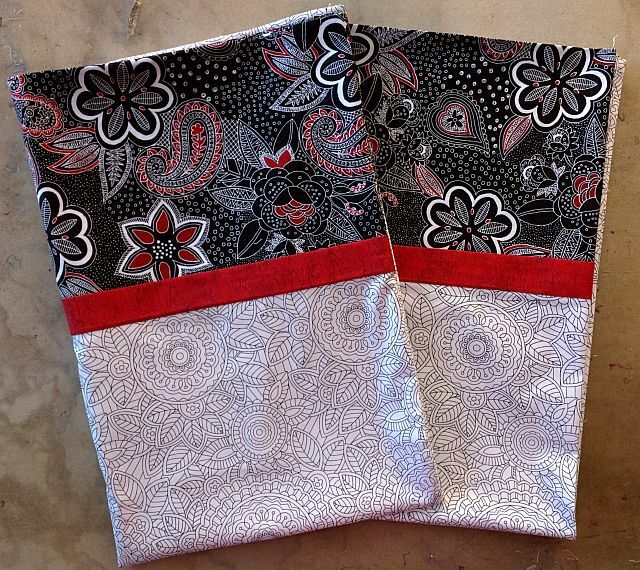 The pillowcase fabric is Masquerade IV by fresh designs for Henry Glass & Co. Pattern # 9246. I bought it while back as well. 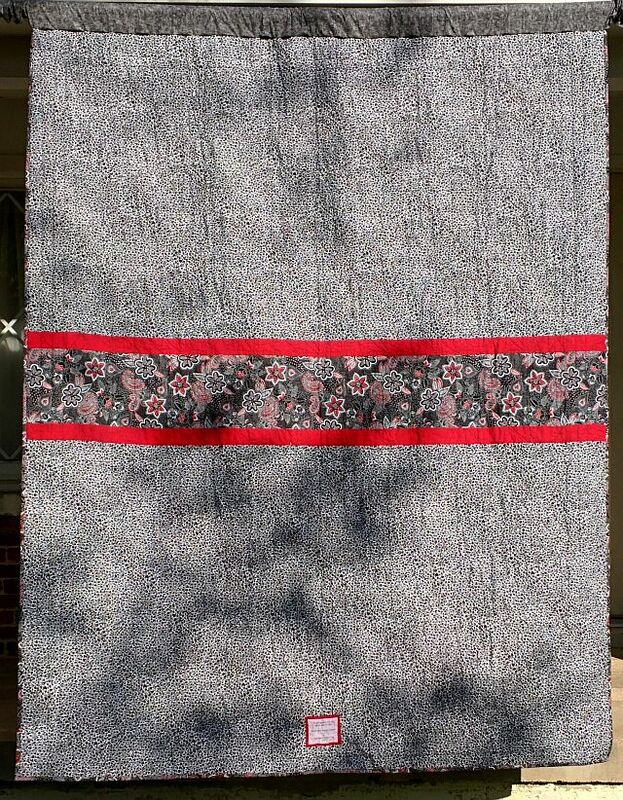 I rented time on a long arm back in January 2013, but ran into some issues and brought the quilt home. Where it sat and sat and sat. It hit the Crazy Challenge II list as a wedding gift so I needed to get it done. I finished the quilting on my DSM, the used ‘Susie’s Magic Binding’ to quickly bind the quilt. A couple of notes on the pictures. Turns out there wasn’t a good place to prevent shadows. I guess I’ve got to get out earlier in the day for shadow free pictures. Cropped out of the first picture, but visible in the second is the temporary hanging sleeve — I simply pinned it on for the pictures. 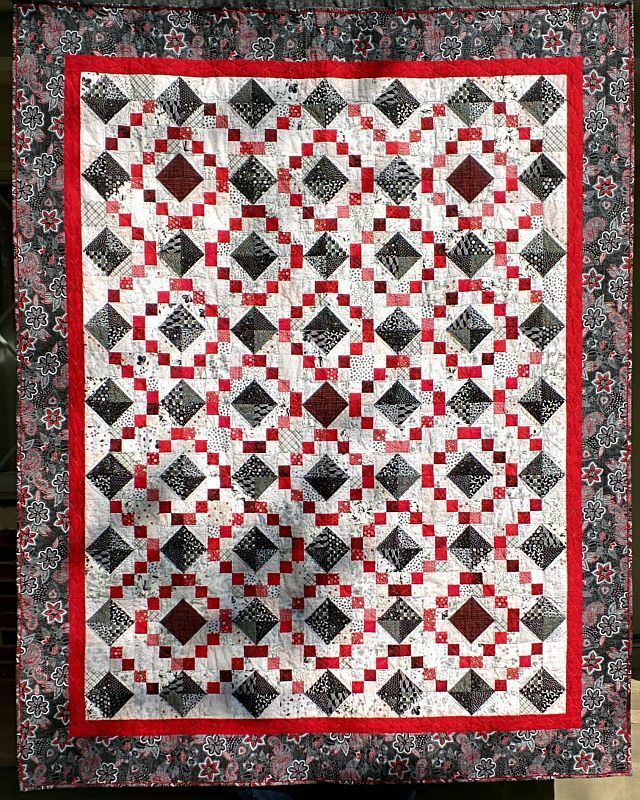 This quilt is on my list for the 3rd Quarter Finish Along – but only because I included everything on the list. I’m sending it to Aunt Marti for the UFO Parade, but since I didn’t get the picture until after 5 it will be in next month’s parade. It’s also being sent in for the 2015 UFO Busting over at Field Trips in Fiber. It is part of my Crazy Challenge II which started August 15th. The recipients will enjoy this quilt. Great fabrics. I think I still have the pattern on my Back-up CD. This is really beautiful – love the design and the B&W with the pops of red. And congrats on finshing off such a long-time WIP too!